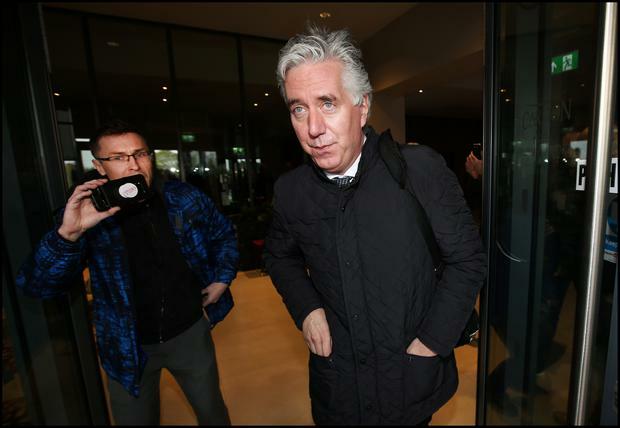 John Delaney has left a Dublin hotel after a meeting with the board of the FAI. The 51-year-old had no comment as he left on his own - to be taken away by a car that was waiting for him. Delaney had been in discussions with the board of the association since lunchtime today. Solicitor Aidan Eames - who was acting on Delaney's behalf when he appeared at the Oireachtas last week - has just left the same hotel. 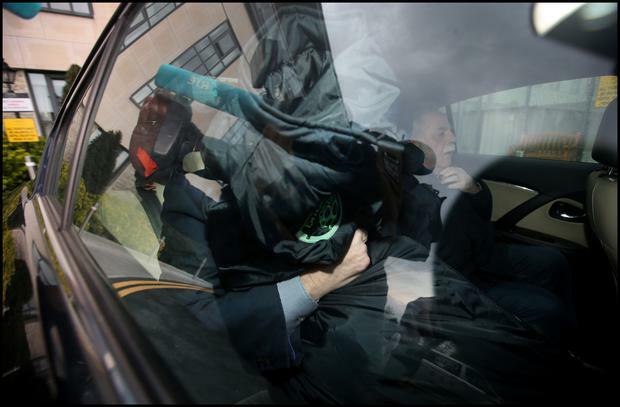 Board members Mick Hanley, Noel Fitzroy and John Earley were also seen leaving the hotel shortly after Delaney's departure. A statement from the FAI is expected before 6pm. The process for Delaney's departure from the FAI is expected to be confirmed today - as board members scramble to answer critics amid threats to €15m in funding. Sports Minister Shane Ross heaped further misery on the beleaguered association as he warned it may not be eligible for new large capital sports grants - worth more than €15m - unless it gets its house in order. Mr Delaney has told friends that he has tendered his resignation from his role as executive vice president to the board and it will let him know its verdict after a meeting today. It is believed that members of the FAI board are furious with Mr Delaney's messages to his backers as it suggests that he is taking the lead on his imminent exit - when the main voices on the decision-making body now want him to go. But the Abbotstown authorities have also spent the weekend formulating its latest response to Sport Ireland ahead of John Treacy's return to the Oireachtas Committee tomorrow along with Mr Ross. The Sports Minister has told the FAI it will not be eligible for new capital sports grants unless it provides answers to Sport Ireland questions around corporate governance arising from Mr Delaney's €100,000 loan to the association in 2017. A €5m grant to the Aviva Stadium for a Euro 2020 upgrade and funding for a €10m centre of excellence at Glanmire in Cork are two projects that are now vulnerable because of the FAI crisis. The renovation of Dalymount Park is another concern, and Finn Harps and Drogheda stadium projects could also come under scrutiny. Sport Ireland will make fresh submissions to the Oireachtas Committee by close of business today. There have been calls for the entire FAI board to step aside but a sub-committee led by president Donal Conway is hoping to ride out the storm by formulating a response. "It's not entirely clear that Delaney going solves it," said one Government source. "It seems like other heads will have to roll." Last night, the FAI released a statement which said it would have replies ready and it had noted comments from Mr Ross and Oireachtas Committee chair Fergus O'Dowd about its silence. "The FAI is engaging with Sport Ireland on the composition of a new governance committee with additional independent members and the appointment of an independent person to the committee of the board examining the current issues," said the statement. "The association continues to work to restore the trust of its stakeholders. The FAI wants to ensure that all those who play football across Ireland do not suffer as a result of the actions of the association." In the statement, the FAI confirmed its meeting today - which will also deal with how to handle the complexities of Mr Delaney's exit. Mr Delaney is confident that he will retain his €160,000-a-year role on the Uefa Executive Committee and European football's governing body has confirmed a member can "technically" stay on if they are not involved with their national association. It is also believed that long-serving honorary secretary Michael Cody and treasurer Eddie Murray will not be staying on as part of a board reshuffle that has been accelerated. Germany's Reinhard Grindel stood down from the Uefa committee last week after leaving his own association due to allegations of undeclared earnings. It was reported in Germany that he initially believed he could retain his role with Uefa as he does not have to stand for re-election until 2021. Uefa has said it is "aware" of developments in Ireland but has refused to provide answers to specific queries on Mr Delaney. Meanwhile, Siptu said 57 football development officers are worried about their future due to grant funding threats.